A horse suffering from laminitis. Despite intensive investigation, founder is still a poorly understood disease, says Robert N. Oglesby DVM. Though easy to diagnose and usually treatable, laminitis has the potential to result in permanent severe lameness making euthanasia the most humane option. The signs of founder are easy to recognize: they are the result of both front feet being sore. The back feet may be involved too, but the front feet bear 50% more weight than the rear so they usually hurt more. With both feet being sore the horse’s steps shorten and become slower making the horse or pony look stiff. At rest he will prop his front feet out in front of him while leaning back on his rear legs to help decrease the weight on the front. Frequently, he will shift weight back and forth from one front foot to the other. As the pain worsens he may start spending a lot of time laying down. This article concerns itself with cause, diagnosis, treatment and prognosis. Founder is a disease of the laminae of the foot. To understand founder you must understand what the laminae are. As weight is transferred down the leg to the foot it does not get transferred directly down through the bottom of the sole. The foot (coffin) bone is suspended from the hoof wall by the laminae. The result is, weight transfers to the walls of the hoof, then down the walls to the ground. This puts weight bearing on the toughest structure, the wall, and helps reduce concussion on the relatively sensitive sole. To help see this relationship think of a man in a hammock. The man represents the toe bone and the weight of the horse on that leg. The hammock and ropes represents the laminae. The trees, to which it is tied, is the hoof wall. The tree supports the whole weight of the man by way of the hammock. When a horse develops founder, the hammock (laminae) begins to weaken and fray. When the founder is severe, the hammock (laminae) breaks, dumping the man (toe bone) onto the ground. In severe founder, the toe bone comes through the sole on the bottom of the hoof. There was the problem that inflammatory cells, an important mediator of inflammation, were missing during the acute phase of the founder. Something else appeared to be going on. For a long time acute founder was thought to be a disease caused by inflammation and was dubbed laminitis (-itis means inflamed). It is easy to see why: Heat, swelling and pain were present and these are all signs of inflammation. On closer study, several problems with the inflammation idea surfaced. It was often hard to understand what caused the inflammation. Several researchers developed an alternate theory: founder results from too little oxygen getting to the hard working laminae. This was hard to accept because the increased heat and pulse seems to suggest increased blood flow. They had an explanation: the presence of blood vessels that shunt the blood away from the laminae. The purpose of these shunts in a healthy horse is to keep the horse’s foot warm in very cold weather by allowing increased blood flow. During founder they inappropriately open and route blood away from the laminae. Tissue becomes damaged and inflammation follows to help fight infection and remove damaged tissue. The theory has gained support in the last several years and the shunts have been identified with electron microscopy. Recent research suggests that an important component may be platlet aggregation which forms thrombi (clots) and routs the blood away from the lammelar capillaries resulting in ischemia (AJVR, v 58, n 12, pg 1376). There are two recognizable forms of founder. In the acute form the disease comes on suddenly and the severity can vary depending on the size of the insult to the laminae. Some lameness experts believe that in the acute form, most of the damage is done in the initial few hours of the disease. The chronic form of founder affects ponies and overweight horses on rapidly growing pasture or too much concentrate. 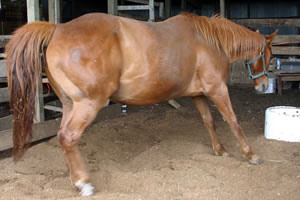 This form of the disease is a recurring problem whenever the horse or pony is allowed to get overweight, eat rich foods, or his feet are allowed to get too long. Damage done during the flare up is usually not as severe as seen in acute attacks but over time the damage can build up. Usually the flare ups are preventable with good management. Whenever an acute case of founder occurs, radiographs are vital to keep up with changes in the foot. Radiographs can monitor rotation of the toe bone within the hoof capsule that correlates to the amount of damage done to the laminae. It may be that you will be watching changes over which you have little control, but rate and degree of change will be your best prognostic guide. Call the veterinarian. While waiting; attempt to get your horse to walk. This helps to increase circulation and relieve some of the pain. Walk him on very soft ground. If he refuses to walk with gentle encouragement do not force him, as this may do further damage.Walking foundered horses has become controversial with some insisting that it does further damage. I have seen dozens of mild founders respond well to walking on soft ground. If the horse does not want to walk after gentle encouragement (a light whip), do not force him is a good rule of thumb. If veterinary help is not immediately available give bute (2 gm./1000 lbs twice daily) or aspirin. There are currently dozens of treatment regimens suggested for the treatment of founder, many whose theories conflict with each other. Except for the nonsteroidal antiinflammatory drug (NSAID) phenylbutazone (bute) no single treatment has been shown to be more efficacious than another. It seems that in some cases what worked last time doesn’t this time and what didn’t work before, does this time. I think that frequently outcome is based on the amount of damage done on the first day and not the treatment selected. Keeping the horse as comfortable as possible requires experienced help. Some recommend the more expensive NSAID’s like Banamine (1) and Arquel (2) over the cheaper bute. There is no evidence that these drugs relieve the pain of founder better than bute as response to pain relievers is frequently dose dependent: the more you give the better the pain relief … to a point. Bute has one big advantage in that we have a better idea of how much can be given for how long and with what effects. The exception would be if endotoxins are playing an important role in the case. Banamine has been shown to block some effects of endotoxins on tissues. The Banamine should be substituted for the bute initially. Dosage for endotoxin blocking effects is poorly defined and it is best to stay with the upper end of manufacturer recommendations. Bute and Banamine have been used together, but no studies are available on side effects. any of the above with pads or pads taped on alone Which may help in your case is determined by which does the best job of relieving pressure at the toe and its associated sole. A frequently recommended treatment is soaking the feet in water. Traditionally, cold water was used and I think some pain relief occurs when a horse has soaked in cold water. It has been pointed out that cold usually restricts blood flow and warm soaks have been suggested as better. I no longer soak feet for acute founder and have not noticed a change in the expected outcome. Hooves that are developing abscesses secondary to their founder need to have the abscesses opened, drained, and soaked in antiseptics. IV bute for pain. The dose is adjusted to affect. Remove the horse’s shoes and roll the toes if there is good sole support from the rest of the wall of the hoof. You want the sole concave with respect to the ground. The toe and its associated sole should be off the ground.Do not do any trimming on a horse with poor walls and thin soles. These horses need all the support they can get. Horses in this category may require special attention and procedures. Place the horse in a large stall or small paddock with very soft footing. If grain overload is involved, several doses of mineral oil given by stomach tube and Banamine as quickly as possible are very important. Low dose acepromazine (.02 mg/kg 4x daily) to increase blood flow. Rotation exceeds 12 degrees. Less than 6 degrees is important if a return to athletic endeavors is hoped for. The coffin bone sinks away from the wall at the level of the coronet. Pain prevents a horse from rising. In the case of remarkable pain and little rotation, there is always hope, but some of these horses will be very slow to recover. They may require several months of care and medication. If the horse is having marked pain, but rotation is not remarkable, consider the possibility of sole abscesses as the cause. Usually abscesses arise unilaterally, so you first notice one foot much worse than another, but abscesses may follow rapidly in the other foot. Any suspiciously painful areas in the sole should be explored. Dr Redding of the Equine Podiatry Center in Lexington, Kentucky, has recommended for several years that when faced with remarkable rotation, elevation of the heels 12 to 15 degrees to be beneficial. Three # 4 pads nailed together is about right. He has seen cases quit rotating when treated this way. The hypothesis is that elevating the heels reduces the forces on the coffin bone that result in rotation, the pull of the DDF tendon. The theory of relieving pull on the toe bone by the deep digital flexor (DDF) is sound on paper and in practice. DDF tenotomy has been used for many years as a salvage procedure to help badly foundered horses. Anyone interested in this procedure should contact the Podiatry Center for the latest developments. Occasionally despite your best efforts, the horse remains very painful and rotation of the toe bone continues. If radiographs show severe rotation occurring rapidly, or sinking to any degree, the chance of recovery to even pasture soundness is poor. Prolonged treatment and expense, while the horse suffers, benefits no-one. hi my horse had something similar and got put down by a vet? so would the vet be wrong? Is overgrown hooves another cause of founder? Yes I have read overgrown hooves can be. I think this article is very well written. For anyone who has had a horse that founders I found a video on u tube and the use of Styrofoam. ( Google horse founder and Styrofoam) worked excellent. Something you can do yourself before the vet comes. provides a lot of relief and my vet thought it was a great idea. When your horse has founder it doesn’t pay to waste your money on a vet. Talk to your farrier. He will help you more than anyone else! My horse had founder and i can still ride him thanks to my farrier! Perhaps your horse was just sore? Riding a horse with founder is irresponsible and dangerous if you damage the laminae and the pedal bone rotates the horse will be lame / footsore forever or worse need to be put down. By all means get your farrier to have a look and trim if necessary but to say don’t get a vet is also irresponsible and cruel as this means you are not giving pain medication that the vet would supply? Your attitude towards your horse needs to be moved out of the dark ages. thank you for sharing this info it has really helped me for my school project. Seeing laminitis as a hoof disease instead of a systemic disease won’t help understanding it! My pony has just foundered (lease pony) I found out this morning and starting crying. Thank you for the tips! Any other help? Tomorrow I am soaking his hooves and spending time with him and brushing his winter coat out❤️ Just to try and make him feel more calm. Anymore help??? My daughters pony just foundered and we have been soaking his feet, put him on a diet but also got him “soft ride boots” recommended by our vet. As soon as we got the boots on him we saw instant relief in him. A week later he’s a whole new pony. We still are getting an X-ray to see how badly damaged but the boots definitely seemed to take the pain away! My horse had a slight episode of laminitis in June and recovered but every three months she is having another one, what would be causing this if nothing is changed, she is on a low sugar diet. Light and suddenly throws a long patchy coat a couple of days of a laminitis attack. Is this cushings equine metabolic underlying the sudden change in coat colour and then long coat. She’s a 14 yr old palamino Welsh mountain X 12:2 mare.